VMP Ep.21 – Flying with Twitter, Danger Zone, B2B Social and much more! The latest social media and digital marketing news (like, today’s!) the big news from the Twitter Flight conference, looks at new B2B ads from Facebook and Yahoo’s deal with Google. Also news from today including Facebook’s new public search function and Zuck’s new school. I also have a chat with Briony from Yelp Glasgow on her experience of Instagram ads to date and answer a listener question about marketing the same business in B2B and B2C. There’s a heck of a lot more than that too! Oh and it all happens in less than 30 mins. Social media and marketing news, views and a little bit of music. See below for show notes! Kenny Loggins- Danger Zone was the first tune! I mentioned my new post that will continually collect great examples (and some bad ones) of Instagram ads, you can read it here. I also spoke to Briony from Yelp Glasgow about a recent Instagram test ad she had run, nice results! I briefly mentioned Instagram’s new Boomerang app too. With Snapchat hitting 4 billion video views per day, I touched on using the platform for marketing and stated that unless your product or service is aimed at a young demo, you should think twice about investing time in it. I mentioned that Instagram could be the one for you as it’s user base is far wider spread across the age ranges. 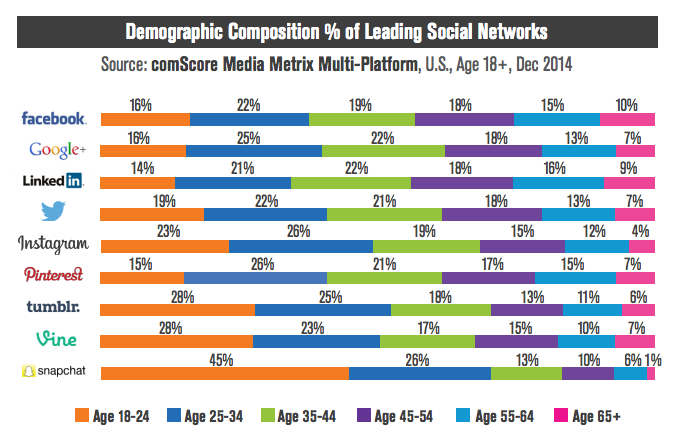 Interesting table from Comscore, although I don’t know why under 18s are excluded. I was asked by Pete from Bake Box Wholesale about marketing to B2B and B2C audiences for the same business. A really great question! If you’d like me to answer your question in the show, feel free to tweet @mike_mcgrail or email me. Big thanks to Danielle Ellis from Edinburgh Foody for recording this week’s trail! I’m looking for listeners to record the intro trail for the podcast for me! I see it as nice way of getting you involved, it’ll be very easy to do and of course I’ll credit you and plug something for you. If you fancy it, please tweet @mike_mcgrail or email me. I mentioned the awesome Stephen Whitelaw who I heard talking about the future of the web last week, check him out!